Hi friend! As you likely know I’m somewhat of a bibliophile and after food and rent I likely spend most of my income on books. 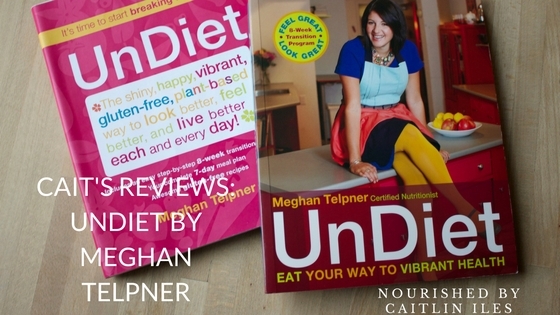 As such, I’m always on the lookout for new alternative health and wellness books and I just realized that I never shared my amazing teacher Meghan Telpner’s book Undiet: Eat Your Way to Vibrant Health with you! Never fear, for the review is finally here! This book is a game changer. It’s completely inspiring, totally authentic, the writing sings, and the research is solid. Most importantly, however, Meghan encourages you to take responsibility for your own state of health by reconnecting with the foods you put inside your body and listening to how those food choices make you feel. This book educates and empowers by demonstrating just how easy and attainable healthy living truly is if you take small steps every day towards your overall goals. Meghan’s plan goes far beyond diet and segues naturally into a connection of mind, body, and soul to create a picture of joyful living that anyone would want to manifest. Undiet is a necessity for anyone frustrated by conventional health and nutrition and looking to take action to create a better body and life. Meghan encourages you to take accountability of their own health and wellness by seeking out information, testing foods and theories on your own body, and ultimately listening to what your body is telling you. In this way her book is completely different from the fad diet books out there that tell you the cure is to eat 40% carbs, 30% fat, 30% protein, or to eat low fat, or low carb, or only raw vegan. Undiet provides steps, advice, recipes, information, and guidelines, but the ultimate message, and one that is not said loudly or often enough in terms of health and nutrition, is to listen to the wisdom of your body. Make some changes and see what happens. If you’re feeling fab, make a few more and so on until your body is healthy and shiny from in the inside out. Eat as much real, whole foods as possible. Test what foods work well for you and figure out which ones may be causing problems. Eliminate problem foods and focus on those that make your body happy and healthy and shiny from the inside out. She encourages you to reconnect with what you put into your body on a daily basis and to recognize connections between what you eat and how you feel, which is something that is so simple, but so often forgotten or ignored. Undiet has a place of honour on my book case so that I’m constantly reminded and inspired to live the best life possible, to treat myself with love, and feed myself with the best possible foods. This book is one of the first that I recommend to clients and friends when they ask me where to start on their journey. As she says, with every choice we make we can either build health or disease, and with this book as a guide you will joyfully choose to build health every day for the rest of your abundant and beautiful days. Some people (myself included!) believe that every experience we have in life comes exactly when it’s supposed to in order to teach, inspire, motivate, or challenge us. If you’re ready to make a change and to stop feeling sick, sad, tired, and unhappy pick up this book and prepare to have your own personal cheerleader at your fingertips every single day. The inclusion of a sort of “cheat sheet” at the end of every chapter that summed up the key ideas and actions that had been covered. Each chapter ended with delicious recipes that corresponded once again to the topic of said chapter. The photography is beautiful and includes many authentic day-to-day shots of Meghan and her friends and family living joyfully. The writing is captivating, honest, hilarious, and informative without being preachy. You will tear through this book. Meghan included practical tips for slowly but surely overhauling your pantry and by extension, your life. If you do yourself one favour this year, it should be to buy this very important and incredibly inspiring book!